Leaving Rotorua we headed north towards Auckland. Before leaving we emailed our new Kiwi friends in Cambridge to see if they were around for a quick visit. Unfortunately we caught them when they were away so nothing could be arranged. Nevertheless we stopped off briefly in Cambridge and strolled among the Sunday street market before continuing our journey. Again we were tempted by a deviation to Raglan on the west coast. The journey was very pleasant through varied countryside but Raglan turned out to be a bit of a disappointment. It has a reputation for being a surfer’s paradise but we could not find our way to the coast, other than that of the large inlet, which struggled to muster a ripple, let alone a wave. Reaching Auckland, we found our chosen motel without any difficulty and, once settled, wandered into the Newmarket district to find food. The Volvo Round the World yacht race arrived in Auckland on Saturday night so we decided to start the next day by heading down to Viaduct Quay to soak up the racing atmosphere. It is all a bit of a circus, with various attractions to entertain and educate us about the race. 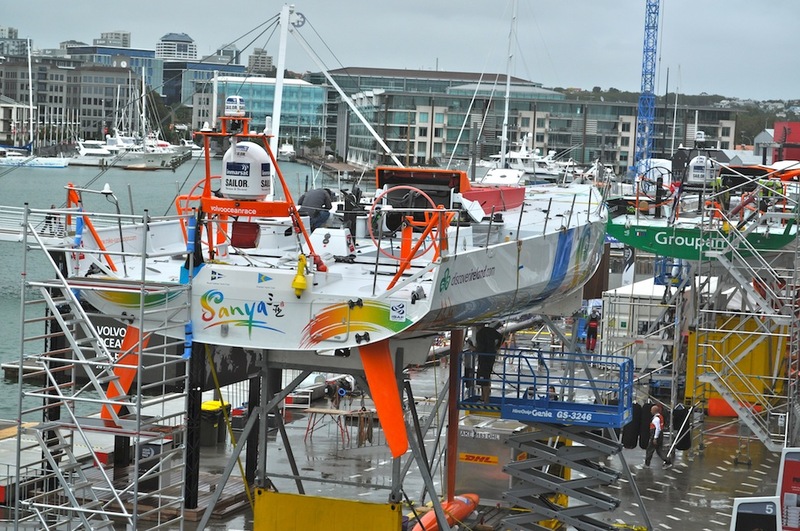 All the yachts were out of the water and stripped down to the hull so that maintenance crews can work on every inch of the hull and the rigging in preparation for the next stage of the race, which recommences next weekend. In addition to the yachts involved there were some superb vessels in port, all oozing money. 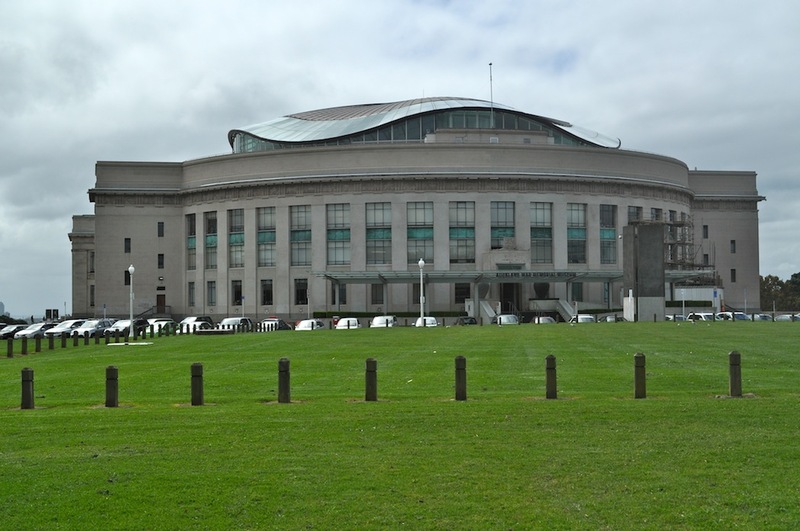 Angela was keen to visit some galleries and museums while I wanted to have a go at the New Zealand Coast to Coast, a mere 16km urban crossing. I enquired at the i-site for details and they were only able to give me a very basic photocopied map, which lacked a lot of detail and was of such a minute scale, it proved useless. We split up and I set off full of hope but soon, not only found the map very inadequate but also realised the path had not signage at all. I also, quite soon, found myself going wrong and receiving duff information from well-meaning people I asked. I spent rather too long wandering around an area called the Domain, a mixture of parkland and woodland. After over three hours, I had walked quite a distance but had only achieved a fraction of my target and knew that I was going to run out of time. I went back to the motel and waited for Angela. In the evening we went down to Viaduct Quay for dinner. Our last day in New Zealand proved to be a scorcher so we decided to escape the city and take the ferry over to Waiheke Island, a forty-minute ride across the Hauraki Gulf. 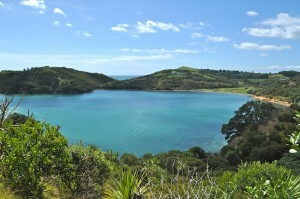 It is a beautiful island with many quiet bays, vineyards and stunning houses belonging to affluent Aucklanders. We walked up grassy track, through woodland and down grassy tracks to Owhanake Bay, a stunning inlet with a narrow deserted beach. One or two of the rather special houses overlooked the bay. It was hot. I was hot. It was too good an opportunity to miss. Not having really planned this trip, or given it enough thought, I did not have anything to swim in. The temptation was too great and, what the hell; I skinny dipped. The water was beautiful. Refreshed, we walked over to Oneroa Bay, a sweeping sandy bay, which was a little more populated and overlooked by a number of shops and cafes. We found one that offered wine tasting. Another opportunity too good to be missed. 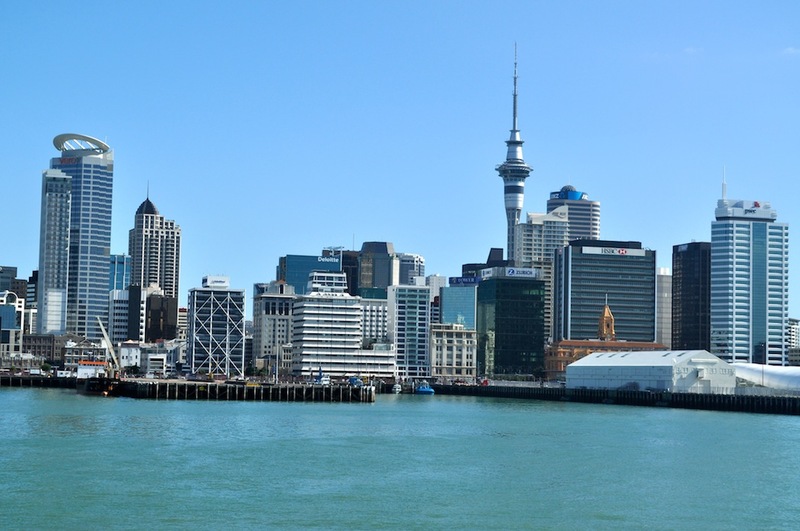 Catching the ferry back to Auckland we relaxed in a bar in a quiet square still bathed in warm sunshine despite being surrounded by city centre tower blocks. Before returning to our motel for last minute packing we found a superb gastro pub for our final gastronomic Kiwi delight. Auckland always appeared, in my imagination as a modern, magic mix of cultures and true enough we have found it such. I spent 2 hours at the Art Gallery, which is a renovated building, re-opened in Sept. 2011. It is something of an exhibit in itself. The roof throughout is held up by beautifully carved wooden ‘trunks,’ which spread out above to mimic palm trees. A charming art student, Katie, gave 4 of us an introductory tour. There are just enough galleries to last an afternoon’s visit. I was keen to see the home-grown art from the recent past; Victorian classic oil paintings thru to Maori tattoos and sketches. I visited the Sky Tower and marvelled at those who want to jump from the top! Finishing the day with a bit of souvenir shopping I was ready to flop at the motel. Our last day has been a memorable one from all angles; wonderful weather, a ferry trip to a quiet beach, wine and great food. We fly out tomorrow having had a remarkably varied visit and the lure of a return is alive and well! The day started brilliantly with clear blue skies and sunshine glistening off the lake. What wasn’t quite so brilliant was having to say goodbye to Stephen. Despite the fact that we have done it many times it does not get any easier. We breakfasted at the i-site and while waiting for his bus Angela and I booked Te Puia for the evening. Then it was time to wave him off. 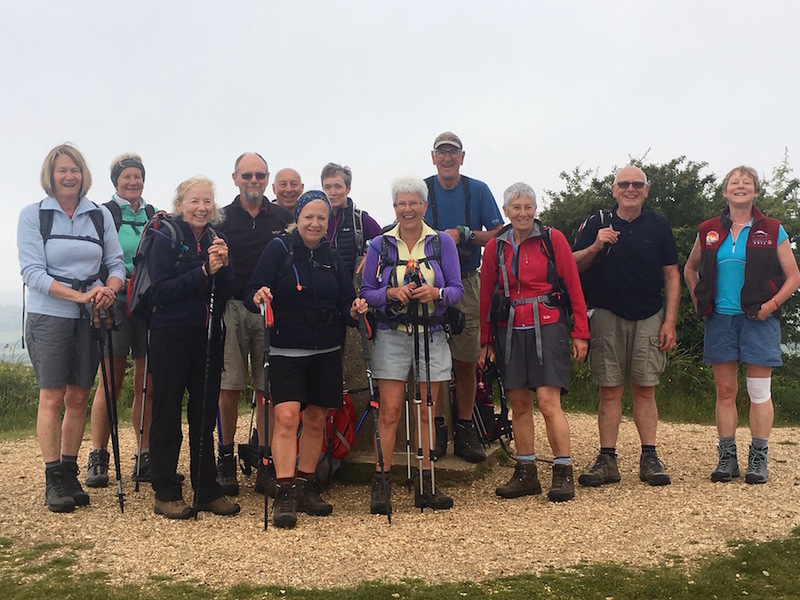 Stephen gone, we quickly had to find something to do to take our mind off his departure, the last of many farewells we have had with our children in recent days. 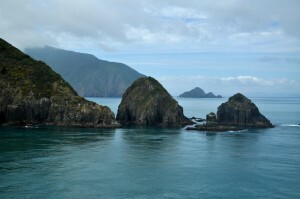 We drove back towards Taupo to Waimangu, the youngest geological event in New Zealand. Waimangu means black water and refers to the dark waters of Lake Rotomahana, meaning warm lake. On 10th June 1886 Mt. Tarawera erupted violently, opening up a series of craters from the northern end of the mountain, all the way up the Waimangu Valley. All life in the valley was destroyed and it became a steaming, bubbling wasteland. There have been subsequent, smaller eruptions since, the last being in 1917. 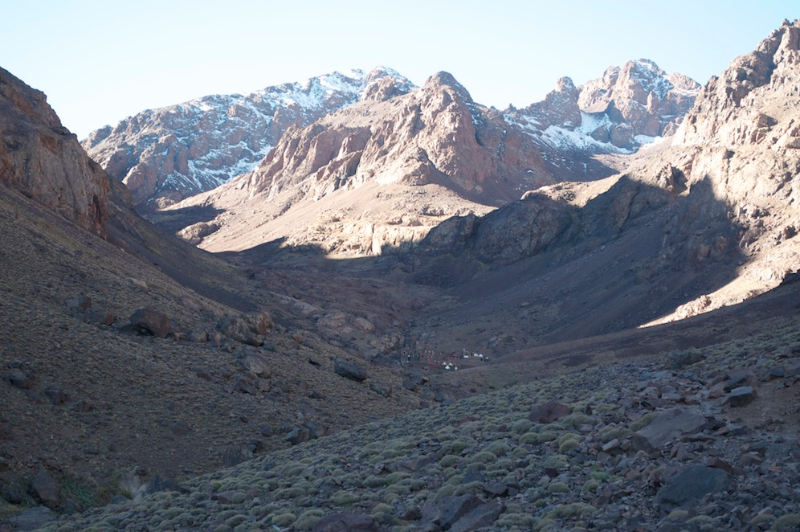 Since then, life has returned to the valley, except to those areas far too toxic to support life, but there is always the threat that the area could succumb to another period of more violent volcanic activity. We followed a trail with markers showering points of interest and where we could refer to the ‘wander’s guide’ for information. There are several steaming pools with sulphurous edges or silica stained edges and bubbling cauldrons, but the most impressive were the blue waters of Inferno Crater. At the far end of the small lake are little shelves cut into the mud showing the varying levels of the water. This fluctuates on a regular timetable; at the moment the level is low. Gradually, over a period of several days the level will rise until the water spills over the edge and flows into Frying Pan Lake below. Remarkably, when this happens the discharge of water from Frying Pan Lake decreases and only rises again when Inferno Crater Lake stops overflowing. A geothermal conundrum. From Crater Lake we took the Mt. Haszard Hiking Trail, which proved to be less interesting than the more popular valley route where most of the geothermal features could be seen. 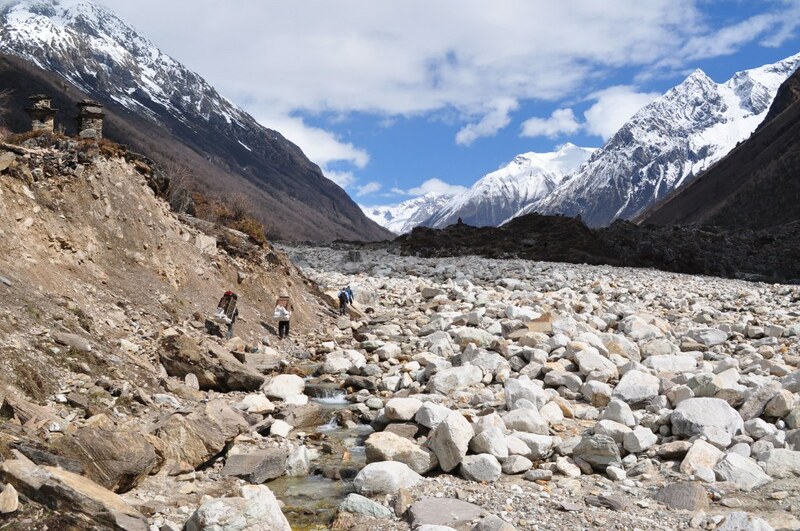 The hiking route eventually brought us back to the valley and some interesting terraces of silica. These were not huge due to their young age but are developing well. There are some vivid greens, yellows and browns. Rather than walk back up to the centre we took the bus back, not because we are lazy but because we were in danger of running out of time before the next exciting event for which we had to be back at our lodgings for 4.00. At 4.00 a bus came to pick us up and take us to Te Puia, a Maori centre on the outskirts of the town. 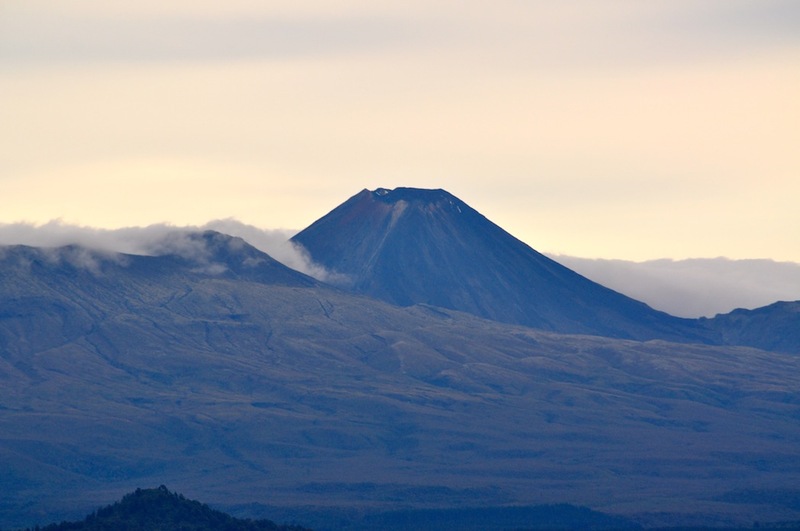 It is centred on a geothermal area, which carries some significance for the Maori culture and also gives them an opportunity to perpetuate the culture through a number of programmes. On arrival we were given a guided tour. Our guide was typically quite a large man but he had a most magnificent voice with really rich tones. We were soon to realise that most Maoris have rich voices, both in their speaking and also in their singing. 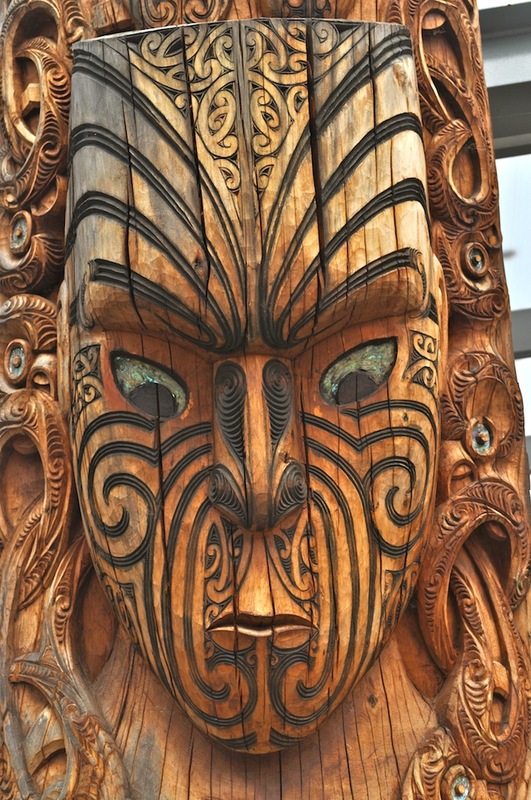 Until westerners started to arrive in New Zealand Maoris did not have a written language; all their stories and legends were depicted in carvings. Many of the stories involved evil demons. Hence the rather scary tendency in their wood carvings. 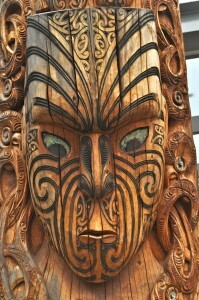 Te Puia has a wood carving school for young Maori men to learn the craft and perpetuate the culture. Similarly there is a weaving school on site to perpetuate the skills involved in weaving New Zealand flax. The tour then took us to some of the traditional buildings, the food store and the meeting house, which we would go in to later. We were then taken around the geothermal features, the mud pools and, more impressively, the geyser with two spouts shooting out at different angles. 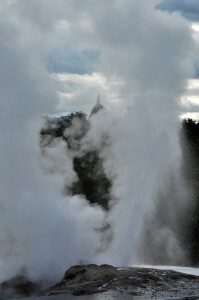 This geyser tends to emit jets of steam most of the time but there are periods when it is more active than others. We were lucky and the jets were shooting several metres into the air. Before we went into the meeting house we had a look at the Hungi, the underground oven where our food had been cooking for three hours on hot rocks. In metal trays there were sweet potatoes, potatoes, lamb and pork joints and a number of whole chickens. It now had to be prepared for serving so we returned to the meeting house where we were given a traditional Maori greeting. All greetings start out with a degree of suspicion, until it is verified that we come in peace and mean them no harm. Taking our shoes off we entered the meeting house where we were given a display of Maori singing and dancing. The singing has a definite operatic style to it. The music was good but the performance is also given with plenty of facial expression. This is so important in the Haka. 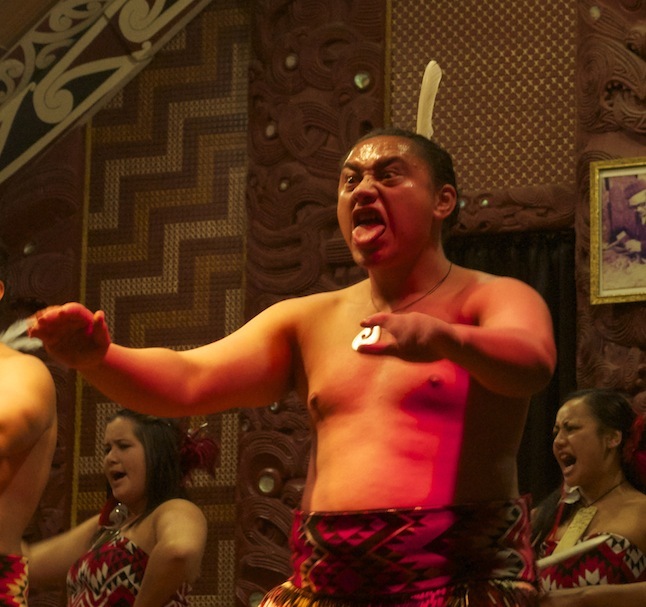 When Maoris prepare for war they face their enemies and perform the Haka. The idea is to undermine the confidence of the enemy and fill them with fear. The enemy perform similarly, but eventually one side will out perform the other and will take a definite advantage into battle, if it goes that far. The Haka, as performed by our hosts did not intimidate but it was an impressive display and in a more hostile situation I think I would have run. They are big men and can look very fearsome. Entertainment over, we went into the dining room for our feast. It was really good and there was much more food than just that cooked in the Hungi. By the time the meal was over it was dark and we again had the opportunity to go up to the geyser and watch it perform in the night sky with a couple of lights playing on it. At 9.00 we returned to our motel and for the pop concert taking place on the open space opposite. There were several thousand people there and there was a really good, family atmosphere. It was a free concert, except for those who chose to buy seats in front of the stage. What we saw was very impressive. 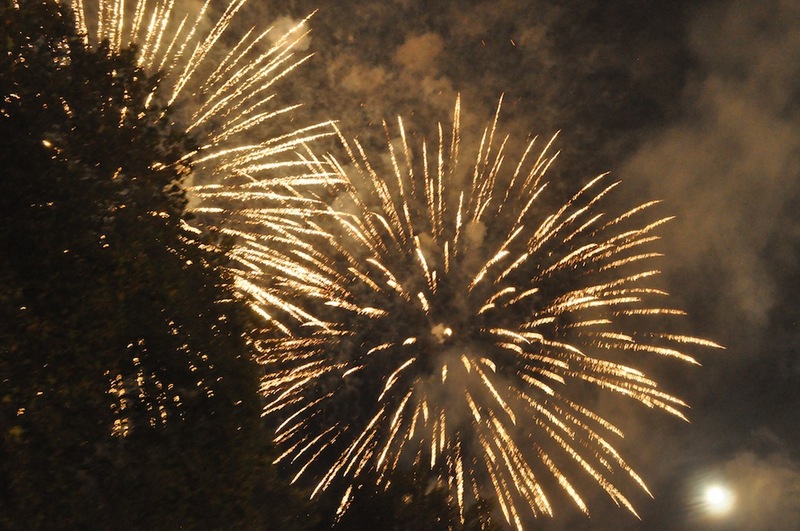 We only caught the last half hour as it finished at 10.00 with a spectacular firework display, bringing to an end a very good day. 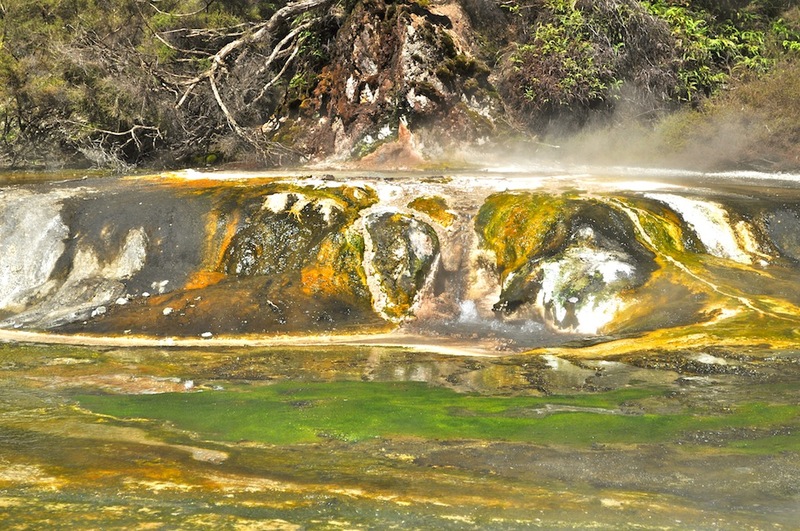 Our stay in Rotorua is characterised by the aroma of the sulphur from the hot springs which bubble and steam throughout the area. Our motel has under earth heating! We said “Goodbye”, to Stephen as he boarded the ‘Naked Bus’ to Auckland, no not what you think just a stripped price! 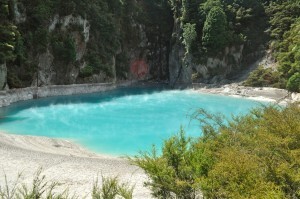 Then we were off to Waimangu to cheer ourselves up with a walk through the newest geothermal park in NZ. It was very impressive and a hot sunny day too. Later we were treated to a Maori experience at Te Puia. I loved it all, carving, weaving, a traditional concert (with Haka) and a hungi meal. To top it all we saw the geyser blow TWICE, once in the afternoon and again at night. My yearned for glimpse of a kiwi in the gloom was rather insignificant by comparison. Lastly we enjoyed the last half hour of the pop concert by the lakeside. We had a little bob too! 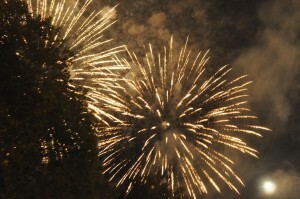 Then marvelled at the fantastic fireworks, which brought it to a finale. We woke up to a beautiful morning, clear skies with extensive views across the lake to Tongariro. Remarkably, we discovered at the i-site that the crossing was still closed. It seems somewhat restrictive if they close the route down at the hint of a breath of wind. We now had other plans in store. Our birthday present to Stephen was going to be a bungy jump. We took him to the Taupo Bungy Jump site on a cliff above the beautiful Waikato River, New Zealand’s longest river emerging from Lake Taupo. The bungy jump is from a platform jutting 20m out over the white cliffs dropping 47m to the beautiful blue waters below. We paid the $149 for the jump, left Stephen to prepare while Angela and I went to the viewing platform to watch and film the jump. It took a lot longer for the event to happen than we thought and watching Stephen in the queue on the platform he looked a little bored. He also looked perfectly calm. I suppose, when you do what he does for a living, flying into remote jungle airstrips in Papua every day, a bungy jump is pretty insignificant. Eventually, his turn came, he was hitched up and without any fuss he stood backwards on the platform and immediately threw himself in a backwards arc into thin air. The plunge took him almost to the water (he was disappointed as he had requested a head dunk) before the elastic pulled him back up towards the platform and down again. 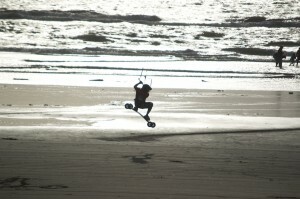 There were several more bounces before he dangled above the boat ready to pull him in and detach him from his bungy. Meeting him a few minutes later he was perfectly calm and relaxed about the whole affair. If you want to see his bungy, you will have to wait until I put the video on to You Tube. 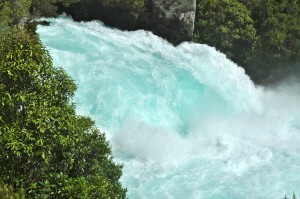 A little further downstream from the bungy are the Huka Falls. Despite the drop only being 20m they are well worth a look, simply to stand in awe at the volume of water, which passes over them. Leading up to the falls the river is about 100m wide but then it gets squeezed through a band of harder rock only 20m wide. The pressure from behind forces the water to rush through the narrow gap and push it over the lip of the falls at the bottom end. 220,000 litres of water per second drop over the falls and despite the small drop they are spectacular. You can only stand there and marvel at the power of water. 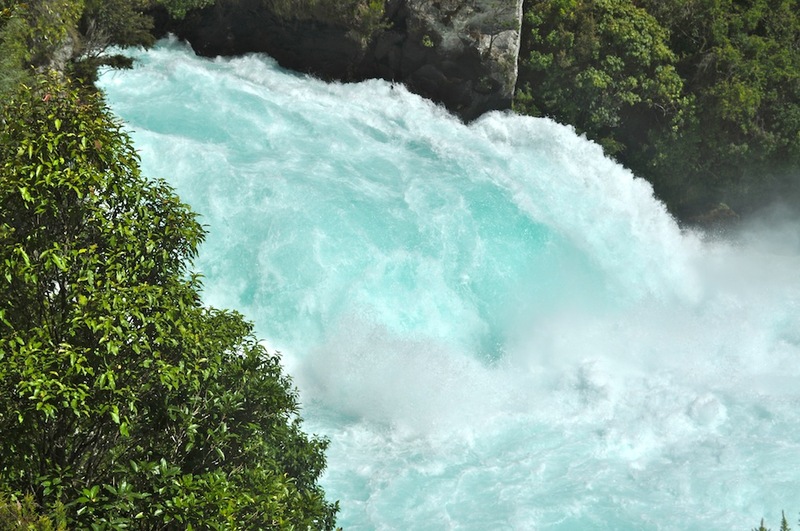 The Huka River produces 15% of New Zealand’s electricity needs and it is easy to understand why when you witness such power. I was only disappointed that while we were there nobody came down in rafts or canoes. That would have been a thrilling spectacle. From the Huka Falls we headed towards Rotorua but before we left the Taupo region altogether we visited the Craters of the Moon spectacle. 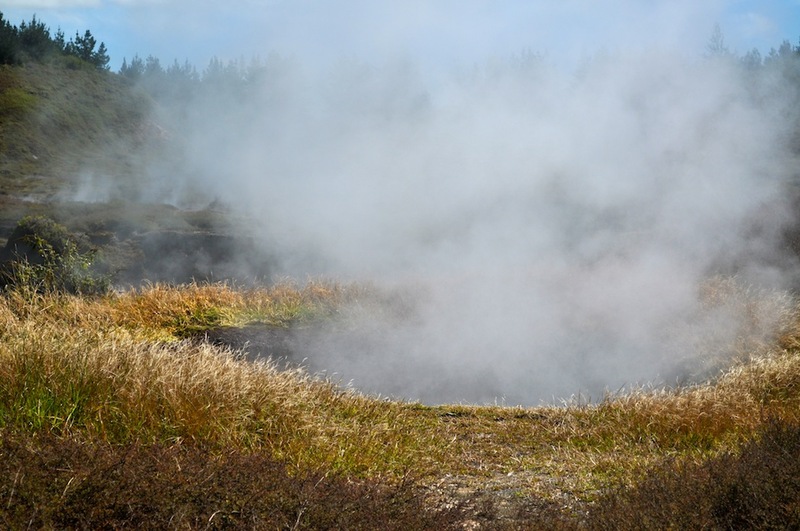 The Craters of the Moon is a relatively new geothermal area, created by accident when New Zealand was developing its hydroelectric schemes in the 1950 and changed underground water levels. 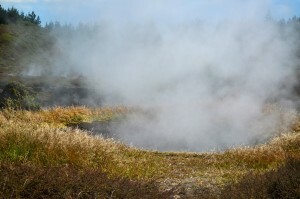 Underground pressure shifted with new steam vents, thermal pools and mud pools appearing. When you enter you are clearly entering an ancient volcanic crater. A walkway through and around the bowl takes you to all the best bits although I would have liked to see a little more volcanic action. 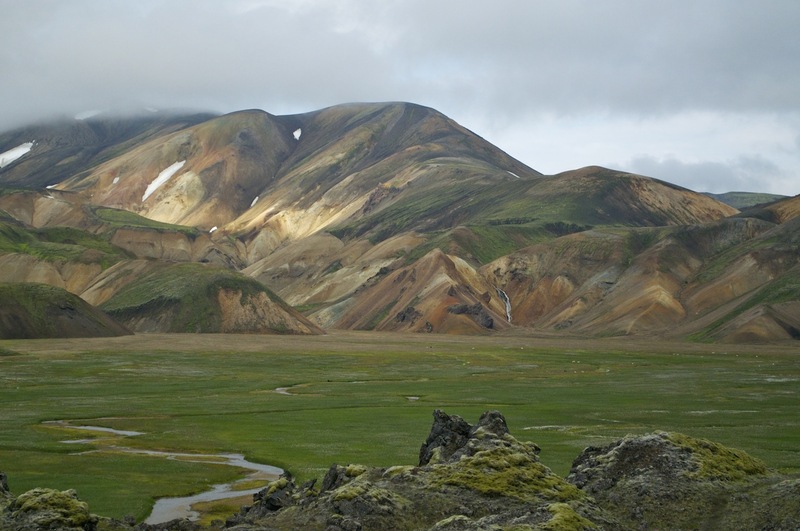 The last eruption here was in 2002 and nobody knows when the next will be. 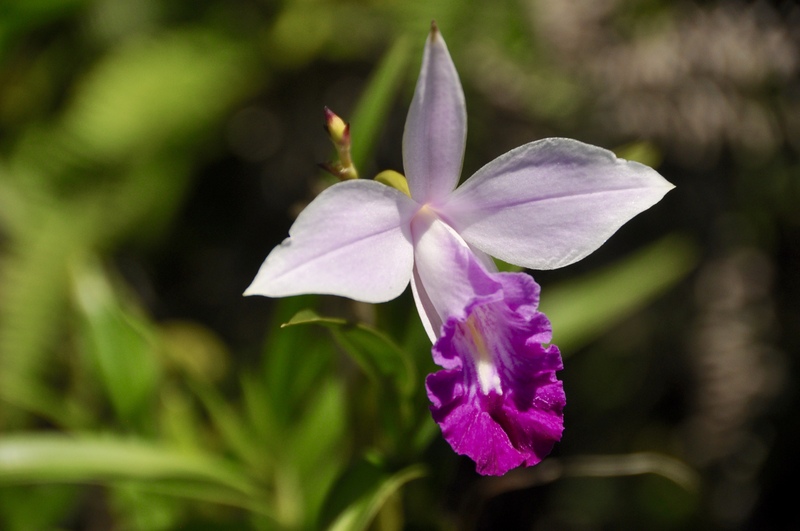 The predominant plant growing throughout the crater is Prostrate Kanuka, which likes the warm soil just below the surface. 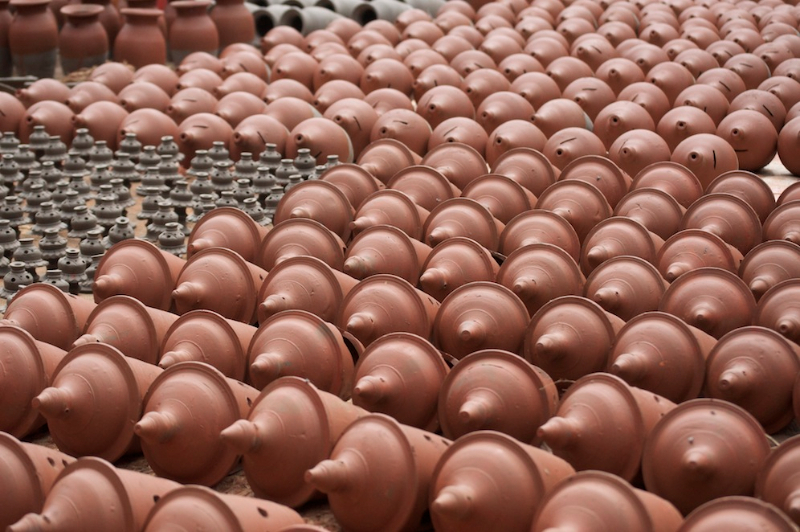 At a depth of 5cm the soil is a toasty 33°C. As we travelled towards Rotorua we kept getting distracted by places of interest off the main route. We looked at the Wai-O-Tapu geothermal centre but it looked very commercial and was quite expensive. 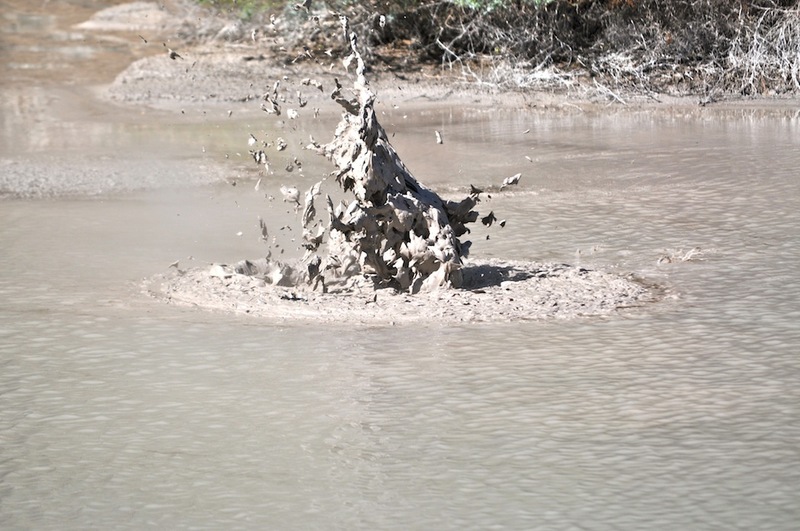 However, not very far away we came across some impressive mud pools bubbling away and creating fantastic shapes with each minor eruption. The small globules of uncontrolled mud reminded me of the impulsive leaping of frogs. Another deviation took us to some thermal springs with a variety of hot pools to lounge in and a geothermally heated swimming pool, which was far too hot to contemplate any serious swimming. We just had a cup of tea! We also took a look at Waimangu, the newest geothermal area created by a series of volcanic explosions in 1886. Unfortunately we were too late to visit this, but we might come back tomorrow. Eventually, we arrived at Rotorua and found some accommodation on the lake shore close to a community open space, all set up for a concert tomorrow. Some of the artists were rehearsing, something to look forward to. It was Stephen’s last night so we went out for a cracking meal with a bottle of wine to celebrate spending some valuable time with him. We are not sure when we shall see him again so it is good to push the boat out a bit when we do. Here we are in the middle of North Island but on a vast lake, staying at a ‘resort’ all of which makes it feel like the coast! A great spot and frequented by families from Auckland in the North and from Wellington in the South. Most New Zealand men are fishermen (bait is readily on sale at the petrol stations). 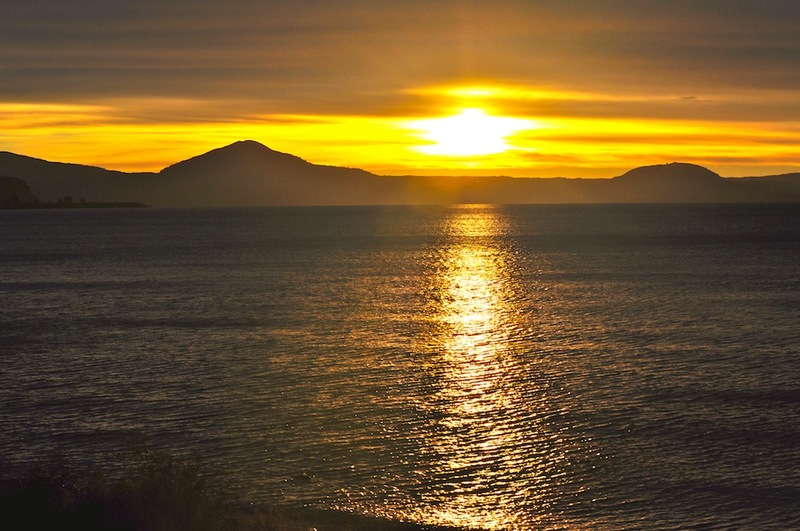 Hence Lake Taupo has become the trout/salmon capital of NZ. During the night I became aware of strong winds and rain battering our wooden chalet. The prospects for a good day did not look good. Daylight brought some optimism as the rain had cleared, leaving strong winds. The forecast spoke of 80kph winds easing to 50kph during the day. Leaving Wanganui, we headed for Mt Teranaki, a perfect conical volcano used as a backdrop to the film The Last Samurai, because it could easily be mistaken for Mt. Fuji. The drive was fairly uneventful, the only real interest being the damage we saw as a result of last Saturday’s storms. Trees took the brunt of the storm and there was a lot of debris at the side of the road. There were copses of large conifers and many of them had been broken in half as if they were match sticks. In one area there was a whole woodland where virtually every tree had been snapped, leaving 15 – 20 foot stumps sticking up into the air as their only memorial. Occasionally there was evidence of structural damage to buildings. Leaving the main highway we headed for Dawsons Falls, one of the points of access to Mt. Teranaki. As we entered the National Park, the landscape changed from agricultural to dense tropical forest. The mountain above was shrouded in low cloud. 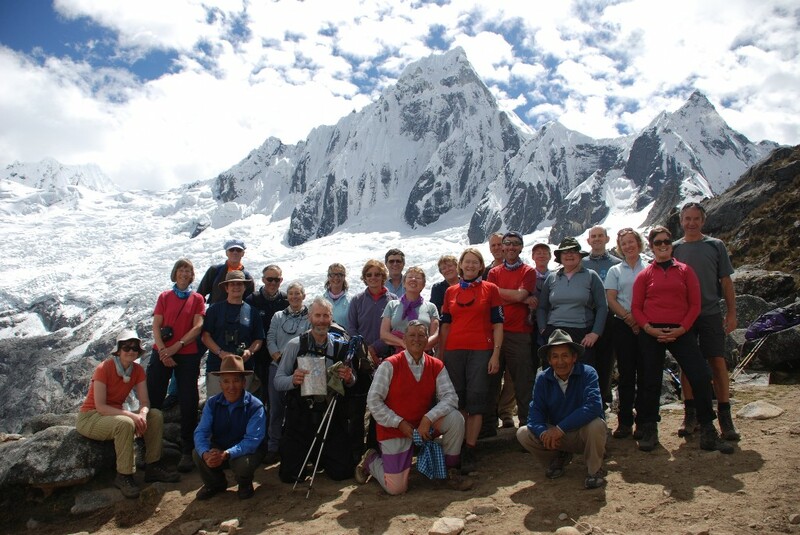 When we reached the DOC centre the temperature had dropped significantly and there was nothing of the mountain to see. This was such a disappointment; the weather had played its part in preventing us from seeing New Zealand at its best. To make up for the disappointment, in part, we visited Dawsons Falls, a single fall of water tumbling 18m over a rocky shelf. Giving up with Mt, Teranaki we visited the i-site in Stratford, where we sorted our accommodation for the night in Taupo and decided to get there via the World’s Forgotten Highway. 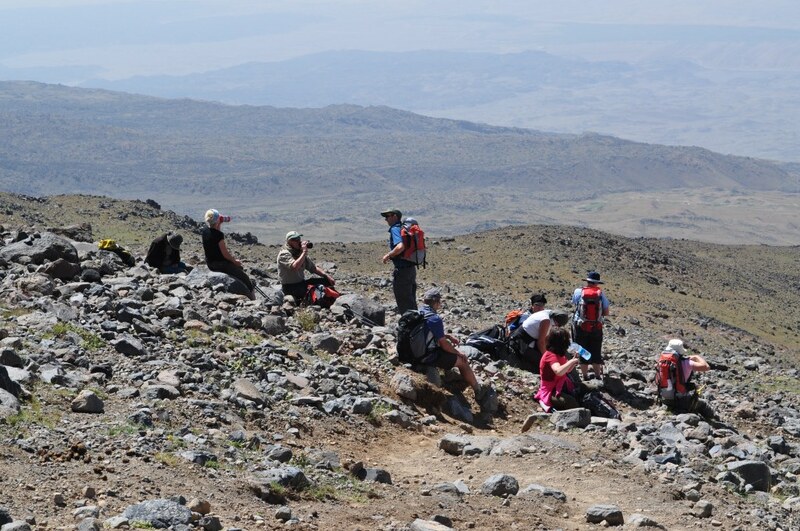 Before leaving the i-site I enquired about the Tongariro Crossing, which Stephen and I would like to do tomorrow. To my surprise I was told that due to the high winds the crossing was closed. The forecast also predicted high winds for tomorrow so the prospects were not looking good. Leaving Stratford, the World’s Forgotten Highway took us on a winding route through some incredible and unique countryside. 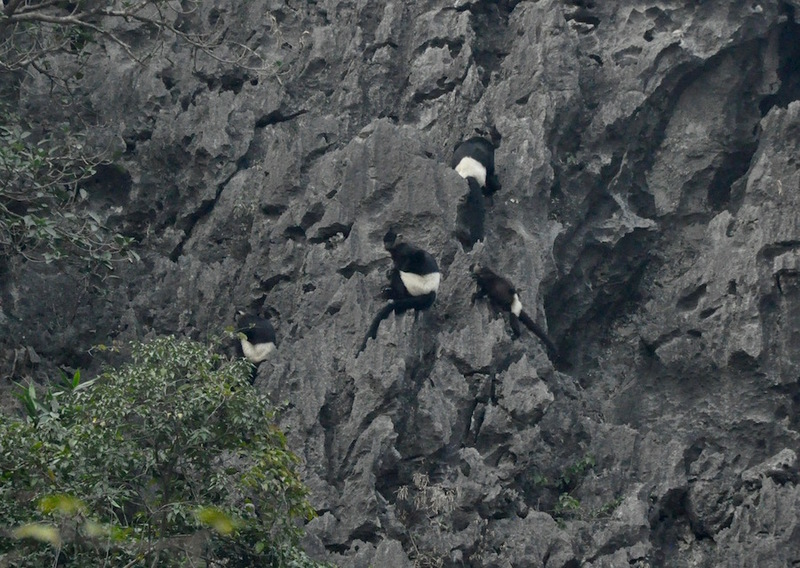 The rock was predominantly limestone with lots of grassy ridges. 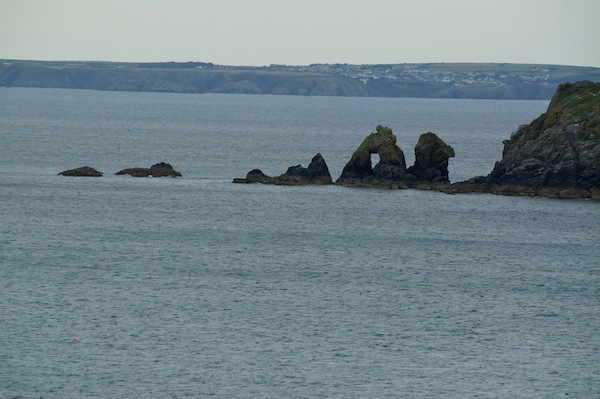 I could not determine the origins but feel it may be a layer of limestone raised by plate and volcanic activity, which then has been weathered to form this fascinating landscape. 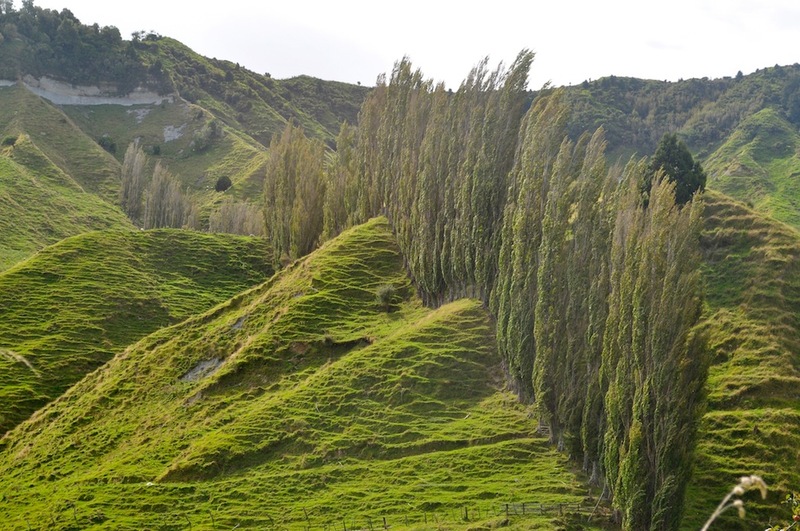 Much of the land is farmed with both sheep and cattle but as we climbed to pass over a series of saddles the farmland was replaced with tropical forest. Eventually, as we got closer to Taupo the road improved. We stopped off at a viewpoint, which gave us excellent views of the Tongariro range in one direction and in the other, the direction we had travelled from, Mt. Teranaki, now clear of her cloudy cloak. 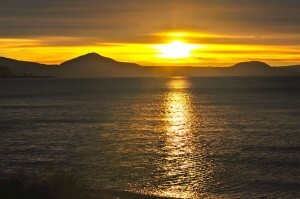 We reached Taupo as the sun set magnificently over Lake Taupo, the largest lake in New Zealand. When we stopped by the lake to photograph the sunset we were amused to find the stones on the beach to be extremely light and when we threw them into the water they initially floated until they absorbed enough water to make them heavy enough to sink. They were rubbish for skimming. Despite the day holding a number of disappointments there were some highlights which made it another good day. It’s been a day of highs and lows; both literally and metaphorically. We were disappointed not to see the mountains because of the cloud, but our high level drive was full of unique landscapes. We were finally rewarded with great views of the mountains. No walk on the high hills but lakeside adventures beckon. The early start was for no reason at all. The hour and a half journey along one of the bendiest roads in the world early in the morning on an empty stomach and making Angela feel ill was for no reason at all. South Island was not going to let us go that easily. Our ferry had been cancelled and we suddenly found we had three hours to kill in Picton before we were going to be allowed to go. We walked around the bay from the harbour along to Bob’s Bay and spent a leisurely half hour there before heading back and checking in. The ferry journey through Queen Charlottes Sound is stunning. It takes a little over an hour for the ferry to reach the open sea but in that first hour we meandered and negotiated our way through some fairly narrow passages. The only thing that would have made it better was brilliant sunshine reflecting on the water. Once we were out to sea it was like any other channel crossing and I went to find a comfy seat to have a nap. Age is catching up with me! To be honest, I set the alarm last night because we had to get up early, and as is usual in such circumstances, I lay awake most of the night worrying as to whether I had set the alarm on my phone correctly. I needn’t have worried. Wellington was looking very dull and there were raindrops on the windscreen as we left the city. In the distance, in the direction we were going we could see lots of clear blue sky and late afternoon sun. 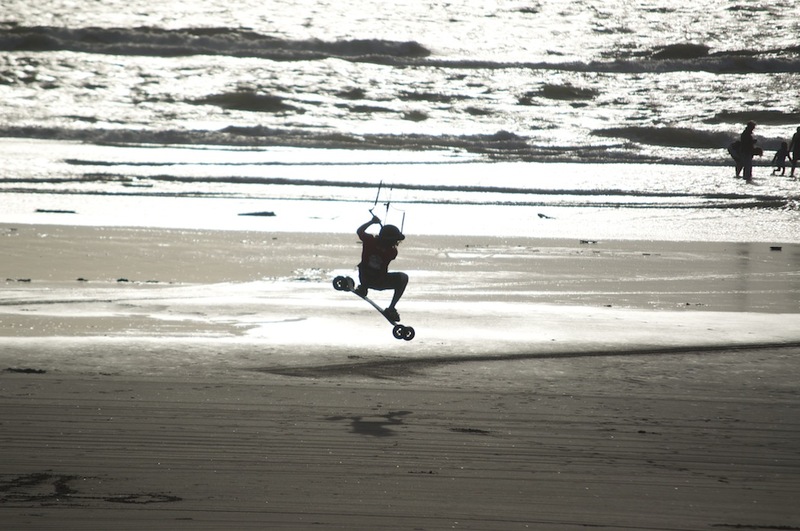 By the time we stopped for a short break at Foxton beach, a beautiful sandy beach, the sun was shining brightly and we enjoyed watching a kite boarder testing his skills on the beach. It was quite windy. The beach seemed to go on for ever in either direction and it is so for much of this coastline, that it is one very long beach. Eventually we found our accommodation for the night just behind the beach at Wanganui – small, basic, simple yet comfortable. Didn’t sleep too well. Woke with a sore throat but we had things to do and places to go so no time to linger. 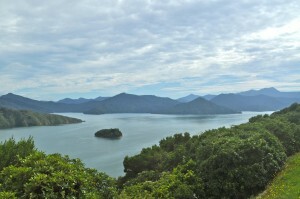 The winding road to Picton took its toll and I was not looking forward to bobbing up and down on the sea! As it happened our ferry was cancelled and we eventually left at 1.15. By which time we had had a good walk around the bay and I was feeling much better. We drove for 2 and a half hours along the west coast of North Island to reach our overnight stop in Wanganui. Stephen is with us so plans are afoot for big walks and bungee!!! !